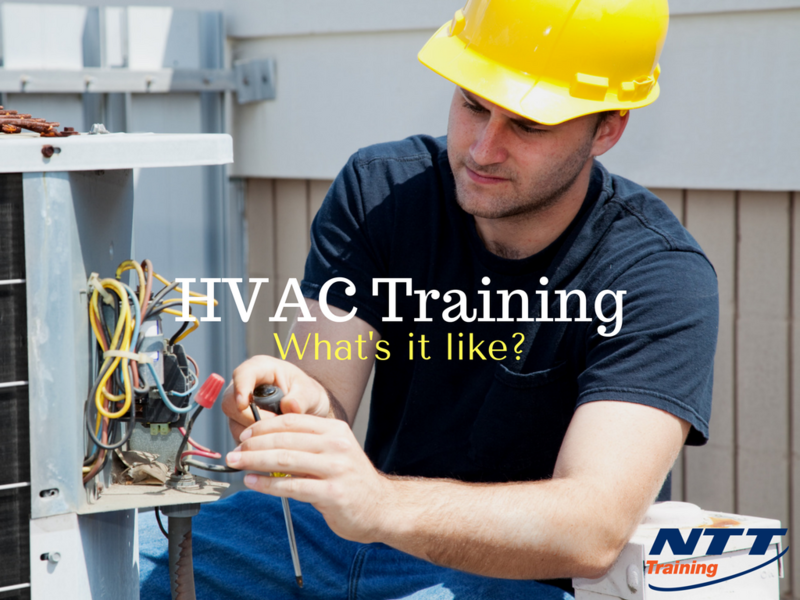 NTT Inc. - HVAC Training: What is it Really Like? HVAC Training: What is it Really Like? Changes in the HVAC industry these days happen so fast it’s hard to keep on top of things. As new technologies appear and older ones evolve, the impact on cooling and heating systems is expansive. Everyone in the industry, from manufacturer to distributor, from contractor to technician, knows the importance of staying current, and well ahead of your customers. One of the best ways to do that is by ongoing HVAC training. New energy standards have pushed technology to become more efficient, and manufacturers have responded, as heating and cooling systems have been improved to achieve maximum efficiency through computerization and other innovations. As concern for the environment has grown, the air conditioning industry has had to phase out refrigerants, CFC and HCFC, that depleted the ozone and switch to newer refrigerants HFC. It’s important to understand the properties of these refrigerants and the specific equipment they are designed for. HVAC systems, like many other home and commercial systems, can now be operated from afar through smart technology. Technicians need to be up on the latest in smart thermostats. Ever more-efficient equipment is becoming the norm. Some examples are: ductless mini-splits (heat pumps that heat and cool, but require no duct system to deliver conditioned air), zoned systems that employ a network of individually-controlled thermostats for more exact regulation of temperatures in buildings and homes, and electronically commutated motors (ECMs) that run the HVAC blowers more efficiently than a regular AC (alternating current) motor. Increased scrutiny of indoor air quality means businesses and homeowners are interested in technology such as air cleaners and ventilation systems that will keep air fresher. Industry software — Manuals J, D and S — ensures that HVAC installations are the appropriate size. This software provides for much greater accuracy than calculating heating and cooling capacity, ductwork capacity, and equipment size by square footage alone. So what’s the best way to keep your skills up to date in this rapidly changing industry? When it comes to training, you might want to explore the several options. These include online training, sending employees to classes at local workforce training institutions, or bringing in trainers to present classes and seminars. Naturally, in the HVAC industry, you’ll want to give employees the opportunity to update skills in operation and maintenance of gas-fired heating systems and forced air cooling systems. A typical training seminar might consist of a general operation and maintenance class that offers instruction in both heating and air conditioning and refrigeration, although for advanced training, the classes might be specific for heating or air conditioning/refrigeration. Providing an on-site trainer at your business or nearby will give your team an advantage by allowing them to learn how to use equipment through hands-on demonstration in a comfortable, and perhaps even familiar setting, without the stress and expense of traveling. Electrical safety. Technicians generally need updating on electrical safety testing, including training with test equipment such as an ohmmeter, ammeter, and voltmeter. Psychrometrics. The study of how air and water vapor interact is crucial for an HVAC technician, who needs to understand principles relating to humidity and evaporation. Control systems. This training would include information on how the thermostat and on/off controls work. Air conditioning principles. Technicians should understand the basics of how air conditioning works: how refrigerant cools a building by removing heat as it travels from the outdoor compressor and condenser coils to the indoor evaporator coils and back again. Handling refrigerant. Only licensed technicians are legally allowed to handle refrigerant. A seminar can teach technicians safe procedures, while providing information on the many new varieties of refrigerant, and why it’s important to avoid mixing them. Air conditioning Troubleshooting. In today high efficiency A/C it is important to charge a system to the superheat and subcooling that the manufacturer call for. In the NTT HVAC training class we go over A/C troubleshooting techniques. For heating systems, a seminar would likely include instruction on troubleshooting of burner problems, manifold gas pressure, the heat exchanger, and other parts. Are you interested in learning more about HVAC training for your team? Contact NTT Inc. today for more information about arranging on-site training at your business. We can tailor our seminars to meet your needs and provide expert instructors who will help prepare your workforce for industry certification.